Taking a break from his independent fare, filmmaker David Gordon Green got familiar with the Apatow brat pack – launching him to direct the uneven but oddly memorable Pineapple Express. His directorial hand was embraced and pushed him down a path helming louder movies like Your Highness and The Sitter, two off-putting crudities that aren’t worthy of Green’s time and talent. 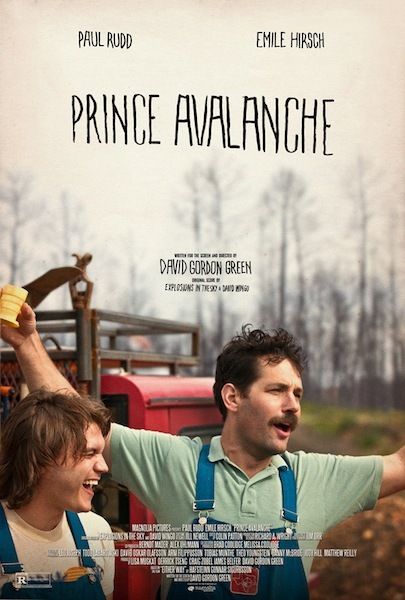 With Prince Avalanche, it feels as if Green is making the type of film he’s been wanting to make for a while. 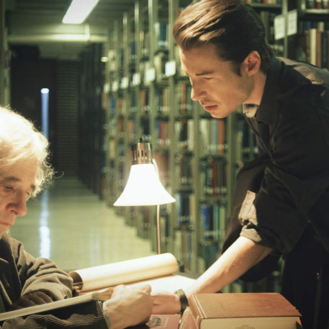 It’s not quite a full-fledged drama or comedy, but it finds the humour in deadpan situations. Alvin (played by Paul Rudd) is content with being left alone. He isn’t an angry person, but he loves the sounds of silence. His co-worker Lance (played by Emile Hirsch) works for the weekend and finds himself being lulled asleep by the mindlessness work. Alvin and Paul are in charge of putting those yellow stripes on empty roads. After a day’s work, they set up camp, quietly enjoy some hot fish, and hit the hay only to wake up at the crack of dawn to lay down more yellow stripes. Rudd and Hirsch are incredible performers, but Rudd’s role especially stands out because it’s a different change of pace for the actor. We don’t know much about the moustache-clad road worker, but we find out tidbits about his unstimulating job and the life he lives with the love of his life – who he writes letters to often. Rudd’s wound-up portrayal of Alvin is immensely interesting. Even during scenes when he’s left to spend the weekend by himself in the woods, his gratification is fascinating to watch. As he says to Lance, he loves to reap the benefits of being alone. Rudd can tell that with the simplest of facial expressions. Because the comedic and dramatic tones are so wildly different, we can’t narrow Prince Avalanche down to a specific genre. It even feels wrong considering it a dramedy because there isn’t an even balance of laughs and downbeat material. It appears Green wants to make a character study about men in solitude. That’s great, and he certainly has the capabilities as a director to do so, but his screenplay isn’t up to par. A lot of backstory about these two characters are kept away from the audience. This is normally appreciated, but Green keeps too much away for too long. Details are eventually revealed towards the final stretch, but this game of keep away doesn’t make these two more than a bickering odd couple. The audience is having fun watching these two argue, watching the fire rise, and then having it explode into something immature, but the possibility of making these two into more rounded leads isn’t taken to its full advantage. So, while Prince Avalanche isn’t at that level it wants to reach as a layered but discreet character analysis, a high number of laugh-out-loud moments and Rudd’s career-best performance makes Green’s latest a modest step in the right direction towards his calling – contained and conscious cinema.